It’s been a while since I’ve shared a Customer Experience story here in Spain so here’s a new one I had recently with Eureka Kids after buying a walk-and-ride toy (correpasillos) for my 13 month old. You can decide for yourself how you’d rate this one. As the expression goes, “If it ain’t broke, don’t fix it”. But if you buy a product and it breaks, you expect it to be fixed, right? 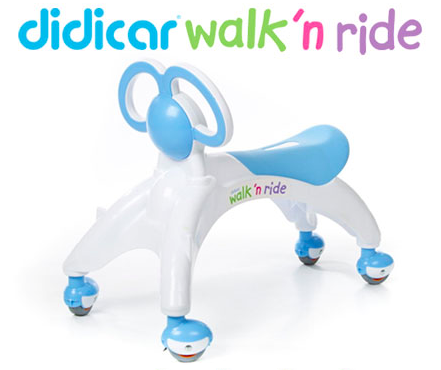 A month ago I purchased a walk-and-ride toy (http://didicar.es/walkn-ride) at Eureka Kids in La Vaguada shopping center. Eureka kids is a big retail chain here in Spain, but the actual stores themselves are quite small, with catalogues of many products that work through distributors. The toy I bought was guaranteed delivered free of charge to my house two days later. As promised, the toy arrived two days later and my son happily began riding all over the place until…the wheels became totally blocked about 2 1/2 weeks later, much to the frustration of the little guy. The next day I went to the store and was told that they couldn’t do anything there, since everything is through a distributor, and that I would have to wait until they got in touch with the distributor to see what kind of solution they could offer. So, I left with the broken bike in hand. When I didn’t hear anything back two days later, I called the store again to see what was happening. The girl who helped me was very friendly and assured me that they had put in the complaint with the distributor but hadn’t yet heard back. So, I called again the next day and still no news. Finally, one week after going to the store I received a call that in two days they would be coming to my house to pick up the broken bike and deliver a new one! How would I rate this experience? The final result has been a success since my problem has been solved and I’ll be getting a replacement bike. But… there were definitely some unnecessary steps/frustrations in the process. It’s important to remember that from the customer POV what can stand out more than the actual end result is the ease (or lack thereof) and trustworthiness of the process itself. The next time I would definitely think twice about buying a product that goes through a distributor instead of being in-stock in a store in case anything happens. Being a bit finicky about customer service and treatment as I am, I’d like to point out one definite item to improve: keep the customer informed! The only thing that’s gained from leaving the customer in waiting and forcing him/her to proactively connect again with the client is frustration from the client’s side and time/costs from that of the client. This entry was posted in Customer Experience, Miscellaneous, Retail and tagged Customer Experience, Eureka Kids on April 14, 2015 by Michelle.